Bad news for PC gamers looking to play some Assassin's Creed 2 or Silent Hunter 5 today: Ubisoft has reported that its DRM servers are suffering from another "attack" and that people are once again having trouble logging in to play their games. 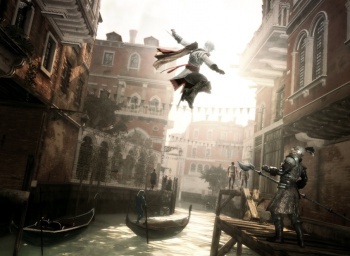 Gamers looking forward to taking on some Assassin's Creed 2 on the PC over the past weekend were in for a disappointment: The servers crapped out for the better part of Sunday and under Ubi's brilliant new DRM scheme, no servers means no game. Ubisoft's original story was that its servers were unable to cope with the overwhelming demand, but today it backtracked and blamed the failure on an "attack" instead. The problem was reportedly solved with all the requisite apologies, but Ubi's forums have been hinky throughout the day and now it seems that the matter isn't quite as settled as Ubisoft had claimed. In a post to its official Twitter feed, the company admitted that it was experiencing more troubles, writing, "Our servers are under attack again. Some gamers are experiencing trouble signing in. We're working on it and will keep you posted." There's no way for us to verify the ongoing outages independently, since Assassin's Creed 2 is only available in Europe and Silent Hunter 5 is only of interest to unwashed military sim savants, so a more up-to-the-minute report from PC gamers living on that side of the Atlantic would be welcome. In the meantime, I think I speak for most of us when I say, nice work, Ubi. You've really set yourself apart from the crowd with this one.